Not just for PvP anymore. Frost Mages are just fine in Warlords of Draenor PvE. You may not top the DPS charts, but you can pull your own weight. You lost very little in Warlords and what you did lose was either replaced or won’t be missed. (Will Arcane Explosion or Evocation be missed?) 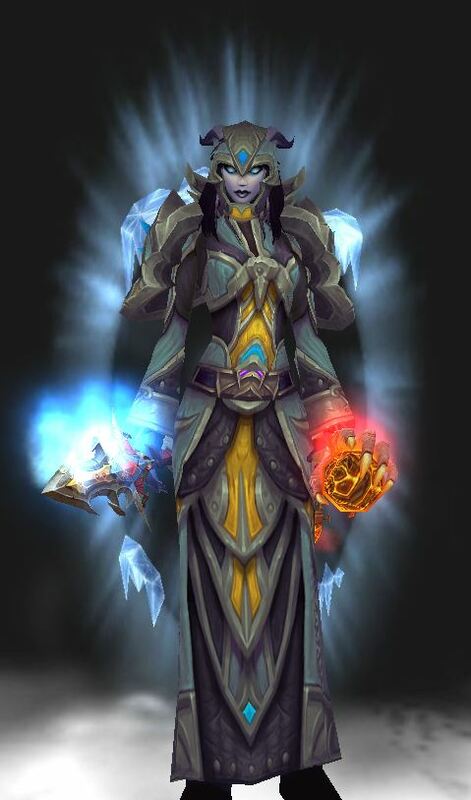 You can check out the changes in our Mages in WoD post. By the way, Shatter and Deep Freeze are now exclusively yours. Alter TIme and Mirror Image are now talents. This page focuses on Frost in a raiding (PvE) environment. For Frost PvP (Frost’s real strength) or leveling, see the links just below. 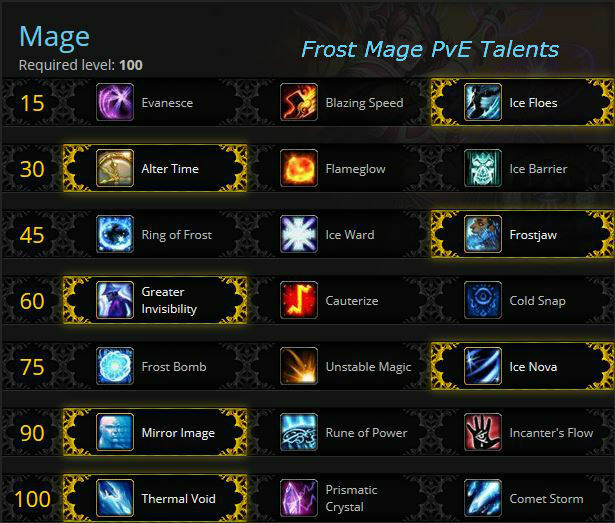 This Frost Mage guide is primarily intended for Raid DPS use at level 100. However, the principals will still apply during the leveling process. If you’re looking for advice on leveling your Mage, check out our Mage Leveling Guide. These talents have been removed or shifted elsewhere: Presence of Mind (Arcane only,) Incanter’s Ward, Temporal Shield, Nether Tempest (Arcane,), Living Bomb (Fire,) Incanter’s Ward. Descriptions are below the image. Our picks are checked: . Any one Talent is easily changed with a Tome of the Clear Mind. Change them to suit the particular fight or situation. Move: Blazing Speed Gives you additional movement, and snare breaking, beyond your Blink. If Blink’s enough for your game then grab one of the others. Move and cast: Ice Floes is great if you need to cast while moving, which happens often enough. Since you’re continuing to cast while moving it’s the best DPS talent of this tier. You can also fire off Ice Floes mid cast. Three ways to mitigate damage. Alter Time is almost like a big heal, Flameglow is for constant minor damage, and Ice Barrier can blunt bursty attacks. Big “heal:” Alter Time will let you “take back” up to ten seconds of time, which can be great for avoiding a lot of damage. If does not allow you to replay duffs and procs anymore. It simply returns your health and position. Also, if you need to run to some point and then quickly return pick this talent. Passive: Flameglow constantly mitigates some damage and was buffed for Warlords. It’s a great choice for fights where you anticipate taking constant, relatively low, damage. It won’t make you a tank, but it will make the healer’s (and your) lives easier. Shield: Ice Barrier’s big plus is that it doesn’t require accurate timing and it absorbs a predictable amount of damage. Especially nice when you can’t count on being healed. As this tier is composed solely of CC, take whichever appeals to you most/suits an encounter best. All can set you up for Shatters. None have any use against bosses. Area: Ring of Frost is an AoE CC. Especially useful when you need to control groups. Or freeze them before your Ice Nova. Melee: Ice Ward is another form of AoE CC with different usage. Likely best used when kiting players in PvP. Could be interesting when used with Ice Nova, but how often are you chased by enemies in PvE? Silence: Frostjaw is a single target CC/Silence, esp. useful against caster mobs. The silence is the reason it’s the pick here, even though it doesn’t work against bosses. Shed effects: Greater Invisibility is a good choice, take this or Cauterize depending on the encounter and how often you expect that the damage reduction of this talent will actually save you versus the effect of Cauterize. If you’re ever pulling aggro and/or you need to get rid of a couple of DOTs, then this is a great pick. Also has massive damage reduction while you’re invisible. Avoid Death: Cauterize sets you on fire which I’m pretty sure is something we tried to avoid by picking frost. On the flip side it saves your life so I think that makes it worth taking. This is a great pick if the boss can one shot you. Works well with Temporal Shield. Use Ice Block to remove the DOT. Reset: Cold Snap resets the cooldown of your Frost Nova, Ice Block, and Cone of Cold. If you need those more than the defense the other talents provide then this is your pick. These three are very close to each other in terms of overall damage. The bomb: Frost Bomb is no longer a bomb. What it does is debuff the target so that your Fingers of Frost buffed Ice Lances (or any Ice Lance if the target is otherwise frozen) will cause an explosion, damaging the main target (with the bomb) and also damaging targets within 10 yards. If you don’t cast those Ice Lances then nothing happens and the “Bomb” just expires, doing nothing. This is the best pick for pure damage, if you can set it up properly (getting the procs and freezes.) If you have the T17 or T18 4 piece set bonus, then it’s the best of this tier in all situations. Tier 18 4-piece Set: Increases the duration of Water Jet by 4 sec, and increases the total Fingers of Frost stacks by 2. Tier 17: 4 piece Set: While Frozen Orb is active, you gain Fingers of Frost every 2.5 sec. Passive: Unstable Magic is a passive effect that gives your Frost and Frostfire bolts a chance to explode on impact, as well as 50% more damage to the main target. It’s the best pick for multiple targets. This is the easiest to use of the three and doesn’t add yet another button to your bar, which is why it’s the pick. Boom: Ice Nova freezes your enemies, giving you a chance to Shatter them, as well as doing very nice damage to the main target. It’s your hardest hitting strike and comes with two charges with a 25 second recharge per charge. The first blast freezes, the second shatters. Wait 50 seconds and do it again. This replaces your Frost Nova, which does not effect your Ice Ward talent (if you took it.) Pretty hard hitting strike, youi don’t have to wait for procs, it’s on demand, but does requires a bit more management than Unstable Magic, though less the Frost Bomb. Back to back Ice Novas can do some very nice damage. Use the Rune if you can stay put, otherwise use the Flow. Burst: Mirror Image is now a talent and is greatly buffed for Warlords, making it a serious DPS cooldown (2 minutes.) Your images benefit from your Multistrike stat. Standing still: Rune of Power is the simplest to use of this tier, seeing as all you have to do is stand in it. Best used on fights with little or no movement, but… that doesn’t happen too often these days. If you don’t like standing still (or can’t) then this is a poor choice. Move: Incanter’s Flow averages a 12% damage increase as it cycles from 4 to 20% and back to 4 (ten seconds peak to peak or min to min.) Take it and forget about it for that 12%, or time the flow and get 20% on a pair of Ice Novas. If you need to move then this talent is superior to Rune of Power. This is the easiest to use of the trio. Extends veins: Thermal Void: Casting Ice Lance extends your Icy Veins by 2 seconds. If you’re firing off Ice Lances all the time (and you should be) then this talent can greatly extend your Icy Veins (which is a 3 min cooldown.) With the Glyph of Icy Veins that can be a lot of Multistriking. This is the best of the talents for multiple targets. Single Target: Prismatic Crystal puts a crystal at the targeted location. Only you can attack it and it takes 130% damage from your attacks. Any time it takes damage it instantly releases that damage, splitting it evenly among all enemies within 8 yards. Fire off your buffs, time your Incanter’s flow to be at 20%, and fire off a couple of Ice Nova’s. It could do some nice numbers. The only issue is that your targets have to stay in place for the duration. Tanks will quite blissfully haul your targets away from your crystal. In theory this is the best single target talent of this group, but it takes a bit more work than Comet Storm. Comet Storm: Comets! 7 icy comets bombard the target area. Now who wouldn’t want “Orbital Bombardment” as a talent? As far as damage is concerned this talent is is very close to the others and is easier to use than Prismatic Crystal. As you level you will automatically learn certain glyphs. You will still need to install them, just as with any other glyph, but you won’t need to buy them. As with talents the Glyphs are easily changed, one at a time, with a tome of the clear mind. The first four will be your workhorse glyphs, swapping Splitting Ice and Water Elemental depending on whether area effect or single target is more important at the time. Exclusive glyphs do not work with each other. For example, you can only load one Ice Block affecting glyph at a time. Required: Glyph of Icy Veins – Your Icy Veins now grants Multistrike instead of Haste, which is a solid DPS increase. Glyph of Cone of Cold – A lot more damage from your C of C, which is nice against weak adds. Glyph of Spitting Ice – More multi-target damage goodness, though not useful against singles. Mobs have to be pretty close together. Glyph of Water Elemental makes your elemental tougher, stronger, smarter, better than it was before. You also have more control over its movements. Glyph of Ice Block – When you Ice Block ends, or you cancel it, you get three seconds of spell immunity (not physical immunity) which is pretty nice. Exclusive with all other Ice Block glyphs. Glyph of Regenerative Ice – Heal while in Ice Block. Exclusive with all other Ice Block glyphs. Glyph of Deep Freeze could be useful if you use it often enough and you’re quick enough to take advantage of the global cooldown reduction. Glyph of Polymorph – is your target covered in DOTs? This will help, by removing them. Most of the minors only have cosmetic value. Glyph of the Unbound Elemental – Improve the appearance of your Elemental. Glyph of Momentum – Nice for strafing. Blink in the direction that you’re moving, rather than facing. Glyph of Rapid Teleportation – Move faster after teleporting. In Warlords Your Hit and Expertise are gone. So is Reforging. You have two new stats, Multistrike and Versatility, and several tertiary stats that can randomly appear on your gear. Gear: Look for Int and Multistrike + Crit. It’s your attuned stat (Ice Shards,) so you get 5% more of it. Your Frost Armor gives you another 8%. Your Mastery’s Icicles benefit from Multistrike, as you will generate an addition Icicle for each Frostbolt (or Frostfire bolt) hit and each of their Multistrike hits. Your get more Brain Freeze procs from Frost Bolts that Multistrike. 10% chance normally, 25% if it Multistrikes once, 40% if it Multistrikes twice. Glyph of Icy Veins causes your Icy Veins to grant Multistrike instead of Haste, which is a solid DPS increase. Crit: There is a soft cap at 33.3% (36.33% Vs Bosses) total Crit for your Shatter ability, where you have a 100% chance to crit frozen targets. Arcane Brilliance gets you 5% closer to that cap and any other crit buffs (such as that 5% raid buff) will also help. Your crits also generate larger Icicles for your Mastery to fire off. Note that bosses subtract 3% from your Crit chance, being 3 levels higher than you, hence the higher cap. Haste: Get as much as you can. Then get more. Faster casts mean more procs over time. Your Water Elemental also uses your Haste and so will also cast faster, for more damage over time. Versatility increases damage and reduces damage taken, it just doesn’t increase it as much as the others. Most Frost Mages feel that this Mastery is the least valuable of the stats (Ok, they hate it.) It does effectively make your Ice Lance (and pet) hit harder, but that’s about it. Tertiary stats sometimes appear on gear that drops (not on gear you buy.) These stats cannot be enhanced or stacked, other than by being lucky enough to find additional items with the same stats. They are: Avoidance, Leech, Speed, and Indestructible. As mentioned above, all this is based around level 100 raiding, though at least parts can be used for lower level encounters. If you’re not there yet then check out this Zygor review. Note: your pet’s power should all be on keybinds. You want it shooting them off on your demand, not automatically. At times you will want the freeze, at other times you will want the waterjet. Waterjet and Frozen Orb should not be used at the same time as they will step on each other’s procs. Arcane Brilliance for more spellpower and crit. Keep this up at all times. Arcane Brilliance should be active at all times (and your Frost Armor is now passive.) This is a big increase to your Crit and Spell Power. Always have your Int flask up. Have your Int potions ready to go. Exactly what you do in the opening and the follow-up depends on the talents that you take. Using Ice Nova, instead of Frost Bomb, is a less frustrating rotation. Use your Int potion right before entering combat, then use it again during a burst phase. Are there adds present? Use your Elemental’s Freeze. If you have Frost Bomb then use it (yes, before Icy Veins) IF you know you will be getting the F of F procs. If you have Mirror Images then use them. If you have Prismatic Crystal and if then enemy will be in one place for a decent length of time then use the crystal. If you have Ice Nova then use it now, twice. The exact rotation/priority depends on your talent pics. In the rotation below you’re assumed to be using Frost Bomb. If not then just adjust a bit according to the talent notes below. If you’re using Unstable Magic – Cast away as normal, and cast your Ice Lance as soon as you have the proc. Ice Nova should be cast on cooldown, unless you want to save the charges for a burst, such as into a pack of adds which you just froze. Frost Bomb should only be used when you have the Fingers of Frost procs for your Ice Lances, preferably at least two of them. Your Frozen orb and your Elementals’ Water Jet will also cause procs. The bomb does no damage by itself. Mirror Image should be cast as soon as it’s available. Ideally you will be able to do this when Icy Veins is up and/or at the peak of your Incanter’s flow. Rune of Power requires you to stay put, though you can put up a second rune if you know where you’ll be going and will then stick to that spot. Incanter’s Flow requires nothing special. Try to keep an eye on the flow and cast your big strikes at the peak. Prismatic Crystal requires the target(s) to stay in one spot for a time. If they do then your’re golden. Cast Frost bomb on the boss, then Frozen Orb, and then drop the crystal at the center of your target area. Your glyph of Splitting Ice will let your Ice Lances trigger the bomb. Comet Storm as it’s available. Frozen Orb should be used when available. It will give you an immediate Fingers of Frost charge when it makes contact. The Freeze ability of your Water Elemental grants 1 charge of Fingers of Frost guaranteed with the potential for 2 should it hit multiple targets. Cast this on Cooldown. Use Ice Lance when you gain charges of Fingers of Frost whether from your own spells or your Water Elemental’s Freeze ability. Make certain to spam Ice Lance when you anticipate generating a number of Fingers of Frost charges quickly to avoid wasting them. Times this could occur include at the start of an encounter when you have the Freeze and Frozen Orb abilities available, both of which generate charges quickly. Cast Frostfire Bolt when Brain Freeze procs. Frostfire Bolt with Brain Freeze up will let it benefit from Shatter. Takes priority over Ice Lance if the target is about to die, as it does hit harder. Frostbolt is your primary attack spell when no other options are available for use and to maintain the debuff on a target. Icy Veins increases spell haste (Multistrike) by 20% and reduces spell pushback by 100% for 20 seconds with a 3 minute cooldown. Use this every time it’s available. Mirror Image is to be used on cooldown. How to Frost. A basic DPS guide. Language alert, but do you care? The rotation section starts at 7:50. In brief: Gem for Multistrike in any available sockets. Note that since you’ll likely only have a couple of gem slots that you won’t lose much by dropping down a level or two from the top gems, but you’ll save a lot of gold. Gems sockets have some random chance to appear on gear, but they’re nowhere near as common as they used to be. Gems are all prismatic, meaning they fit into any socket. The new Warlords gems have only secondary stats (Mastery, etc.) There are no Warlords Meta sockets or gems. Older (Mists of Pandaria) gems work until item level 600 and the item squish of Warlords cut them down a bit. What used to be 160 Int is now 10, for example. Older gems that used to code for Hit now do Crit, gems that had Expertise are now Haste. Warlords gems cannot be used in non-Warlords gear. Here’s a basic scheme for socket matching for those Int bonuses for gear under item level 600. Burning Primal Diamond for your Meta slot, until you can complete the legendary quest and get wither the Sinister Primal Diamond or the Capacitive Primal Diamond. Brilliant Primordial Ruby in red slots and belt buckle slots, also and blacksmithing sockets you have. Veiled Imperial Amethyst in blue slots. Any enchant can be added to any piece of lower level gear, including the Warlords enchants. Their value will scale down appropriately. This is the only way to get Multistrike before level 90. Note that any of the high level enchants can be added to the lowest level gear. So go ahead and put Multistrike enchants (or whatever) on your low level heirlooms. Pre 90: Heirlooms are generally as good or better than any other gear you’ll find until 91. Otherwise just get the best gear you can find or buy. Enchant for Multistrike. Note that Pandarens get twice the food buff. Oralius’ Whispering Crystal: +100 to Int and Stam. It does stack with the runes and does not stack with your flasks. This is a reward from one of your Garrison’s Inn quests: Oralius’ Adventure. Crystal of Insanity: +57 to all stats. Stacks with Runes, but not flasks. Drops (10% chance) from Sulik’shor, in the Valley of the Four Winds, in Pandaria. Runescroll of Fortitude III: 8% increased Stamina to your entire group. Get it from the Auction House or someone with Inscription. In Warlords all of the profession perks (added stats) are dead. Professions are just for gear now (and a few misc items,) or the gold. Your level 2+ garrison profession building can be assigned a follower, which will both increase the output of your work orders and provide you with some bonus perk. Song of the Anvil – “Your armor and weapons do not lose durability from use for 4 hrs.” Just the thing for an extended dungeoning session, right? Engineering will let you create a number of useful items, such as rockets, shields, a stealth device, etc. These cannot be used in the raid, but that can be used elsewher. Your follower will sell you a Walter (two uses) for a very low price. This gives you bank access and everyone else repairs and awful food. Alchemy Chemistry is fun, unfortunately you can’t make acids or bombs. You can make flasks and potions to boost stats and cause other interesting effects. You can also make a very nice DPS trinket: Draenic Philosopher’s Stone, requires Alchemy 500. This item is upgradable to 715 in 6.2. Leatherworking will let you make leather and mail armor. You can also make Drums of Fury for a Heroism type buff (25% Haste for 40 sec.) Through the Leatherworking hut in your Garrison you can make single use tents that will increase all of your stats by 10% for an hour, though not in raids or rated PvP. These tents are account bound, so you can mail them to all of your alts. Mining, Herbalism, and Skinning are fine for fueling the appropriate profession and for working on your gold supply. Your garrison can help with all three, having a follower working the appropriate hut will increase the output. In Warlords the Tauren are still unable to become mages, but the Pandarens can. Go figure. As far as racial advantages no race is wildly better than any other, especially in Warlords. All the races have something which adds to their DPS. All racials dealing with Hit or Expertise are dead. Blood Elves and Worgen get +1% Crit, Night elves get it by day only, and Dwarves get +2% critical damage. Goblins and Gnomes get +1% Haste and Night Elves get the same at night only. They can stun enemies with a quick strike of their hand. Might have situational use for a Mage, allowing an excape from melee range. Increased benefits from food buffs is a great perk for raiding or any PvE content. Draenei get a bonus to their Int. Draenei are good gemcutters and love their Jewelcrafting. Worgen come with +Crit and a Sprint ability. Can periodically move quickly, which is a generally nice ability for everything from leveling to PvP and Raiding. Crit chance increased, which is nice for any mage. Gnomes have more mana and +Haste. Like the Humies, the Gnomes have an Escape Artist skill and while their small size is nice in PvP it doesn’t help much in raids. Dwarves have a really nice defensive ability. Stone form is nice in PvP and of occasional use elsewhere. It washes away bleed and magical effects and also reduces damage by 10%, which is of some benefit in those “Oh Rats!” situations, such as when the boss is hitting everyone in the raid. Good for PvP with their Escape ability. This ability will have occasional use in PvE and leveling, as well. It will break some of those annoying boss mechanics. The Human Spirit now adds to Versatility. Blood Fury adds to your spell power. Put it in a macro. As with Trolls it’s a cooldown so s pretty nice to have for those heavy damage phases. A slight increase to your Pet’s damage. Increased resistance to stun might have some interest at some point. Berserking increases Haste by 15% for a few seconds. Very nice cooldown, drop it into a macro. Beast Slaying has no value in raids, but it’s very nice for leveling with its 25% extra XP for beasts slain. Voodoo shuffle is a help in PvP, but pretty situational elsewhere. Still, it’s nice to have. Goblin – Good looks, charisma, money… and Haste, too! Increased Haste is generally useful for any mage and you love Haste. Rocket leap is a useful escape ability, like an extra Blink or the Hunter’s Disengage. Blood Elves – Does the hair make up for any failings? Will of the Forsaken is a nice PvP ability, but much more situational outside of PvP. Still, there are times when that boss will try to sleep you or whatever, then it’s really nice to have this. Touch of the Grave is a passive ability that drains life and heals. It will add a bit to your total damage numbers. Undefinite Underwater Breathing (you’re undead, do you breath???) might have some use, somewhere. Leveling a Mage or some other class? It’s pretty easy these days, especially with the Warlords of Draenor changes and since Mages excel at quickly destroying things. Still, there are a lot of quests and a incredible number of things to kill. Wouldn’t it be nice to have a bit of expert help in the “where to go and what to do and how to do it quickly” department? 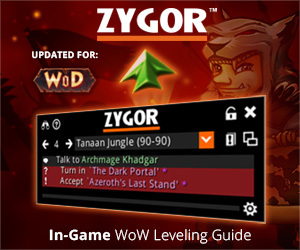 Zygor’s guide gives you that help, whether you’re Horde or Alliance and regardless of your level, at all times. It’s like having an expert showing you exactly where to go and what to do at all times. It doesn’t matter if you stop your questing to gain a few levels in PvP or the dungeons, you’re brand new to the game, or you’re decked head to toe in heirlooms. Come back to the quests and Zygor will figure out where you should be, based on your new level, and update the guide accordingly. It’ll even let you zap your obsolete quests. You’re not even locked into any particular build. Zygor’s guide has a talent advisor which will recommend talents regardless of your class or spec, as well as a few other goodies. All in all you’ll blast to 100 faster than ever before. Freshly boosted to 90? No sweat, Xygor has your back for those last ten levels. Click here to grab your own copy now, and get to the level cap ASAP, or read our review, here.